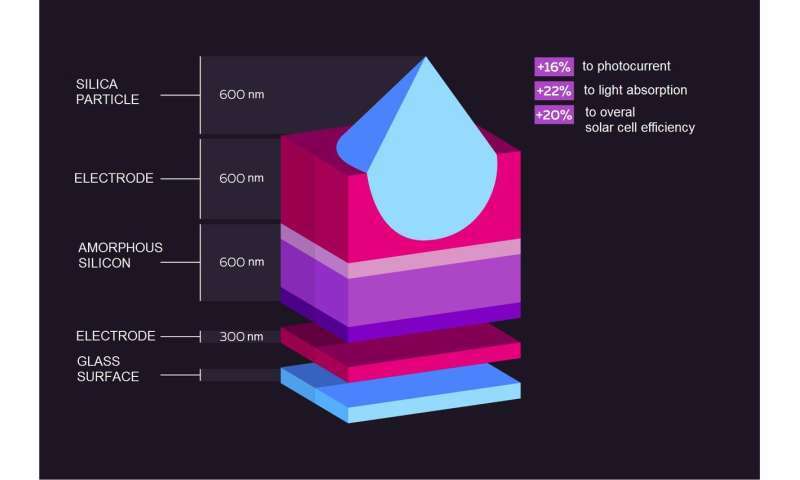 An entire range of materials can be used today for solar cell production. Solar cells based on amorphous silicon, for instance, are basically thin transparent films that may be applied to any surface including window panes. When it comes to manufacturing solar cells, it is crucial to find ways to diminish light reflection from cells and avoid transparent electrode overheating, which prevents solar cells from working properly. Another key issue is to optimize the thickness of an active layer so that each photon reaching the solar cell is converted to electricity. Now, scientists from ITMO University have devised a novel way to address these issues by putting silica particles inside the top electrode. The resulting structure functioned as an electrode as well as a light-trapping coat focusing the light on the solar cell. "To create such structures on the surface of a solar cell, we use the method of atomic layer deposition of aluminia zinc oxide. We literally build these electrodes atom by atom," explains Mikhail Omelyanovich, lead author of the paper. "As a result, overall solar cell efficiency is improved by 20 percent. What is more, such an electrode can be used for thin solar cells composed of any material beyond amorphous silicon." It took the team several years to develop an affordable solar cell manufacturing method that would appeal to the industry. "Three years ago, we tried to cover the cell surface with microspheres. Despite improving light absorption significantly, the major drawback was a high reflectance rate. We considered removing the upper part of the microspheres so as to make something similar to a lens that would focus the light on the solar cell. However, while working on practical realization of this idea we found a much better structure. On the whole, the final solution exceeded our expectations based on theoretical calculations," says Mikhail. According to the authors, the manufacturing of solar cells with such surface coatings does not require complex technology and the process may be easily adapted for mass production.